It’s the time of year when the world falls in love… That’s right, Christmastime. Christmas isn’t just a one-day affair. It is an entire season of celebration, memories, and special time with loved ones. Part of the fun of the holiday season is preparing for the big day itself. 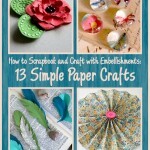 With these free holiday craft eBooks, you’ll have enough decorative craft ideas to last you all December long. Put your little elves to work with Christmas crafts for kids. 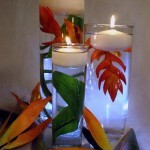 You can even create special angel crafts to bring the peace of the holidays into your home. Learn how to knit decorations for yourself, or bring to life a few free crochet patterns to give as gifts. Don’t forget to start saving your Mason jars after your Thanksgiving feast, because these free eBooks also include cool ideas for recipes in a jar and gifts in a jar. Embrace the spirit of the season and create something to soothe your Christmas anticipation. In this collection of holiday crafting eBooks, you will find everything from friendly angels and pretty Christmas crafts to seasonal crochet patterns and cozy knit gifts. Challenge yourself to make as many holiday projects as you can this Christmas season. Not sure where to start? Download the most desirable eBook, or better yet, download them all! With these free eBooks, you will never run out of ways to keep you and your family entertained this winter. Our five titles include 16 Angel Crafts to Make: Homemade Christmas Ornaments & Decorations, 26 Christmas Craft Ideas: Ornaments, Decorations, and Homemade Gifts for Christmas, Make it a Red Heart Holiday, Jolly Holidays: 15 Free Knit and Crochet Gifts and Holiday Projects, and 34 Holiday Ideas for Gifts in a Jar. What are you waiting for? Choose your favorite eBook and pick out a couple projects. Think of yourself as Santa Claus – with a little bit of patience and creativity, you can bring just about anything to life. 16 Angel Crafts to Make: Homemade Christmas Ornaments & Decorations: When decorating your home, you can’t go wrong with a beautiful angel craft. Whether you are decorating for the holidays or creating permanent fixtures for various rooms, this collection of angel craft projects will help you choose a lovely little angel. Many of these angels are designed as Christmas ornaments, but any one of these beautiful projects would be a great decoration for the holiday. 26 Christmas Craft Ideas: Ornaments, Decorations, and Homemade Gifts for Christmas: The Christmas season is prime time for crafting! It’s the time of year when everyone is looking for ways to spice up their home decor, or give a gift to their friends and family in a new and creative way. Making your own decorations, cards and gifts is a great way to save money this holiday season, and your loved ones will appreciate a homemade gift that comes from the heart. Here we have over 25 quick and easy Christmas gifts to make, give or sell. Make it a Red Heart Holiday: If you’re looking for Christmas ornaments to knit or crochet, free Christmas crochet patterns, or Christmas knit patterns, you will love this eBook from Red Heart Yarns. Throughout the pages of this free eBook, you will find projects to keep your crochet hooks and knitting needles busy all the way up until December 24th. Filled with 26 fabulous knit, crochet, and craft projects, Christmas is the theme of the “Make it a Red Heart Holiday” eBook from Red Heart Yarns and there’s something for everyone. Do you want to make Christmas decorations for the home, Christmas ornaments to knit or crochet for the tree, décor items such as placemats and throws, or knit or crochet hats, scarves, and more as great gifts to keep everyone cozy this year? These free Christmas crochet patterns and Christmas knit patterns are just what you’re looking for. Jolly Holidays: 15 Free Knit and Crochet Gifts and Holiday Projects: Thanks to Red Heart, free patterns for Christmas projects fill the Jolly Holidays eBook. This fabulous free eBook contains crochet Christmas ornaments, patterns for easy crochet Christmas gifts, free knit Christmas ornament patterns, and more. In addition to great knitting patterns for Christmas tree ornaments and crochet patterns for Christmas ornaments, the Jolly Holidays eBook includes knitting pattern for fingerless gloves and easy crochet projects like crochet hat and crochet scarf patterns. You’ll love these Red Heart Yarn patterns from Coats & Clark. 34 Holiday Ideas for Gifts in a Jar: The team at FaveCrafts and our sister site RecipeLion.com have put together a great gifts in a jar eBook. In this 49-page eBook you can find 34 Holiday Ideas for Gifts in a Jar. 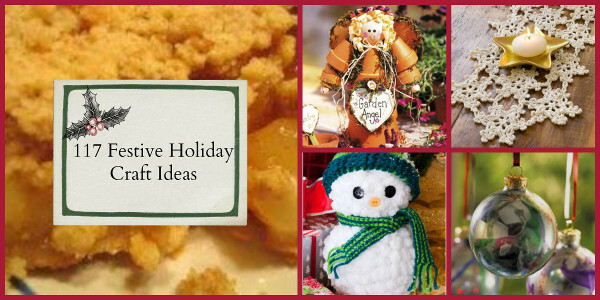 Some of which include honey bath scrub, chocolate body scrub, snowmen jars, apple pie in a jar, and gingerbread recipes. 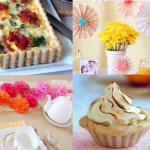 These delicious recipes and adorable crafts make the perfect gift if you are running low on time and money. Don’t spend the holidays out at the store shopping for expensive gifts when you can reuse and recycle items that you already have at home.